Lucinda Cobley is intellectually engaged with her process of painting and printing on transparent materials such as etched glass and clear plastic. The artist possesses impressive knowledge of her materials and at times sounds like a scientist when discussing light refraction or the chemical properties of marble dust. 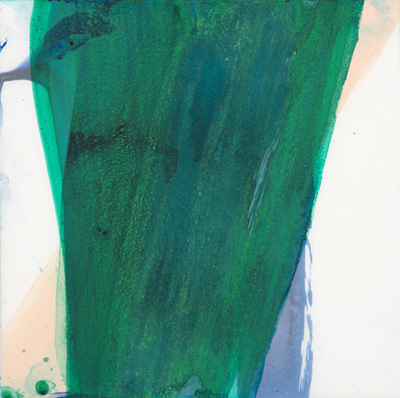 Her practice is to apply oils or acrylics mixed with minerals and pigments such as alabaster, malachite or marble dust, onto stacked sheets of Mylar, frosted plexi, or glass, so that textured paint, reflected light and shadows resolve into meditative translucence. Cobley recently opened her Sequence exhibition at Wade Wilson Art (up through April 27), and when I previewed it I was disarmed by seeing all of her favorite materials in a single exhibition. There was complexity and cohesion in the presentation that moved me. To anchor my understanding of her chosen process, as well as her evolution in the last five years, I asked a few questions. Virginia Billeaud Anderson: Let’s begin with printing. 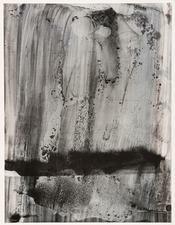 You are exhibiting mono prints in Sequence, and simultaneously in Santa Fe. Last year you exhibited prints in Wade Wilson’s Impressions show, and in the Spring Street exhibition, and at the Museum of Printing History in October. Tell me about your printing. Lucinda Cobley: I had not done any print making for many years. It evolved out of working with transfer drawings using carbon paper. I realized I was making a simple print, so that led to mono printing using a brayer, a rubber roller, and a sheet of glass. At first I tried to keep things simple and clean but after a while I began to “let go” and that process became exciting once I began to print from various surfaces such as strips of wood and rubber. About a year ago I joined Burning Bones Press, a print-making co-operative so I could have access to a printing press and evolve. I got excited about re-reading Paul Virilio’s The Aesthetics of Disappearance . Virilio’s book got my brain working! VBA: That’s impossible reading. I’ll never forget the day I saw those large sheets of plastic drying in the sun. 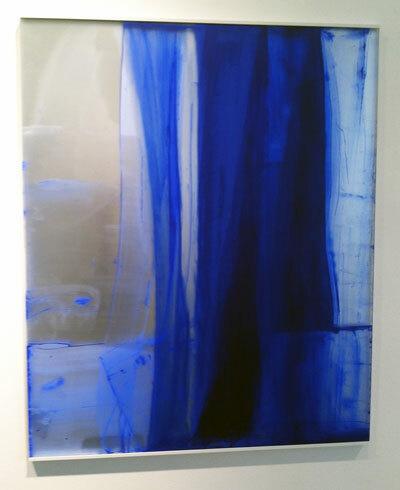 Blue-toned ink created translucent horizontal forms that were also grid-like. Passages ranged from visually abrupt to faint and timid. Many reminded me of waves. 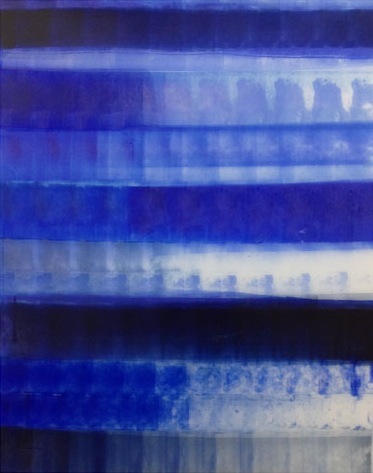 LC: The horizontality of the Intervals series was akin to landscape - water and sky began to materialize out of forms created from the brayer's lap marks which appeared like changing atmospheric effects and time elapsing, as the ink petered out across the surface. Intervals (transition), one of the new pieces from this year, is a hybrid work. I started by using a brayer and transferring marks by mono printing methods, but then went into it with a brush and worked it into a painting. But I used printmaking ink, which is different from drawing ink such as India ink. It's more viscous. VBA: You are known for your layered glass works, and of course glass design was a specialty in your art education in England. (It might surprise you to know I’m aware of two other Houston-based artists who completed postgraduate work at Central Saint Martin’s, both teachers.) Talk about your glass work. 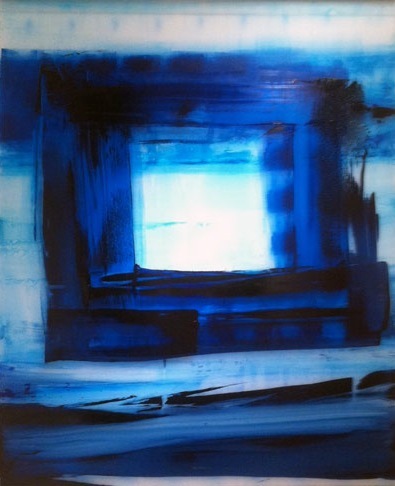 LC: The (Dis)appearance triptych in “Sequence” is glass, it’s made with acrylic and pigments on etched glass. It contains 3 glass panels that I “etched” into, with the sandblasting process. The panels are etched on the reverse side. VBA: That triptych’s coloring is subdued compared to the more boldly colored glassworks in the 2010 Revision series. I recall a striking magenta with weird blurring. Color seemed to float. LC: For Revision, I painted on both sides of the glass, so it’s fair to say paint was vigorously applied. Also I sandblasted both sides of the glass, meaning I used compressed air to shoot sand to give the glass a granular texture. Due to layering, etching and textured paint, those works have the perception of depth, the reflection and translucency I desire. VBA: You incorporate plexi into works, and some of the new plexi pieces have mirrors. LC: My Reverb series is made of plexi and mirror plexi. Each piece has three stacked layers - two plexi layers and one plexi mirror, all painted with acrylic and pigment. VBA: Because we’ve discussed it in the past, I’m aware of your strong interest in pigments. You studied their properties formally, and seriously studied the history of their use from the Neolithic through the ancient Egyptians and Romans, and subsequent eras. And you have lectured on and taught classes on mixing pigments. LC: Yes, by adding pigments one can alter paint’s texture, and alter color visually. Particles embedded within the paint change it granularly so surface quality can be a crystalline finish perhaps or a matte finish. Marble dust is one of my favorites. LC: Sequence includes works from my Transposition: Graphite series. In them acrylic is mixed with graphite on drafting film. I enjoy combining graphite powder with matte fluid acrylic medium. It seems to contrast and also be comparable to painting with white pigments such as marble dust. Both have had long historical use as pigments. VBA: OK, after you mix acrylic paint with a medium, and a pigment, what tools or implements do you use for application? LC: I use a variety of tools - a brush, squeegee, spatula, palette knife. VBA: Plastic makes up a significant part of your portfolio, and it turns out one of your plastic pieces, Revision: White 1, entered the permanent collection of the MFAH. Curator Rebecca Dunham put Revision: White 1 in the museum’s 2011 Synthetic Support: Plastic is the New Paper exhibition, which included works by Jasper Johns who innovated the technique of drawing with ink on translucent polyester film. You told me at the time of the acquisition that Revision: White 1 had layered sheets of plastic painted with acrylic mixed with selenite crystal, and that the ancient Babylonians called the mineral selenite “moon dust.” A shaft of moonlight in your bedroom inspired that painting. LC: MFAH hung me next to a Man Ray! VBA: Lucinda, you once used the word “rhythm” in an artist statement, and in my opinion it’s a proper word for the new small-scale plastic pieces. Most have disarranged columnar forms and diagonals, with estranging colors. LC: The 12 x 12 works are from my Colour Transposition series, in which each piece is made with 2 layers of polyester drafting film, which is actually Mylar. Paint application varied from thick to thin veils of color, I used both runny liquid paint and more viscose paint, and some paints are mixed with a variety of pigments. I attempted to pair the sheets that seemed to work together. 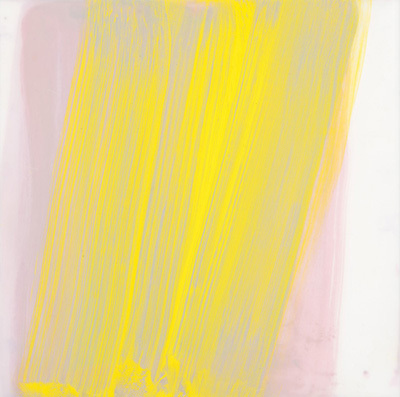 An “eclipsing” takes place as the upper painting creates a dynamic with the lower, obscuring almost completely or contrasting in a way that is visually compelling. After pairing, I tried to unify the whole by reworking the surfaces, adding and erasing paint. The choice of forms - the vertical blocks and diagonals are simple shapes that are vehicles for experimenting with color and texture. The forms are derivative of tree trunks or branches but in misshapen fragmented states, as if seen through a veil. VBA: For all that is deliberate, your process is sprinkled with randomness. LC: It pleases me you get that. 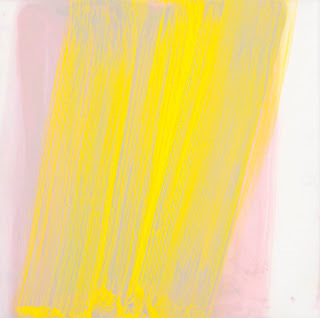 Colour Transposition allowed surprises - heavier gestural marks and unexpected hues. I can do something radically different each time. I enjoy working in a way that offers the possibility of chance arrangements, it keeps the process fresh.